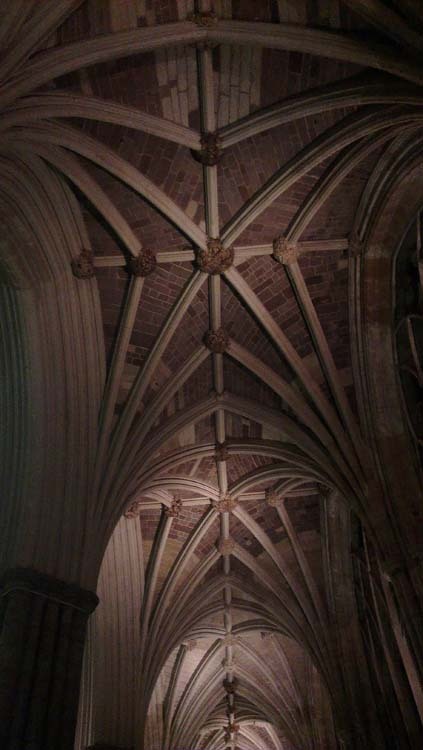 Last week, I went with one of my friends to a carol concert at the cathedral. The Christmas market was in full swing along the streets around the cathedral green. Everywhere was twinkling lights and the smell of mulled wine. Inside the cathedral the choir gathered on the platform at the front and, draped in Christmas lights, they filled the air with the wonderful sound of some of our most treasured Christmas music. There was plenty of John Rutter, a tear-jerking version of Little Donkey with backing by ukulele, a few classics for the audience to join in with (“Five gold rings!! !”) and a foot-stomping rendition of God Rest Ye Merry Gentlemen to send us off out into the night. As we shuffled down the aisles to go home I squeezed my eyes tight shut and prayed for a brief flurry of snow. There was little chance of that prayer being answered in this unseasonably warm December but I didn’t think there was any harm in asking. Never mind, it was still wonderful. This entry was posted in Family and friends and tagged 12 days of Christmas, carol concert, cathedral, cathedral green, christmas, Christmas market, God Rest Ye Merry Gentlemen, John Rutter, Little Donkey, mulled wine, snow, twinkling lights. Bookmark the permalink.